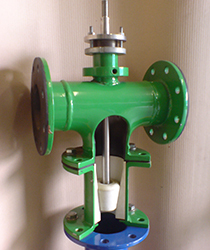 The Ceramic Plug and Seat Valve, available only from PrepQuip, was initially developed to replace conventional pinch-type valves on a flotation column tails discharge system in order to reduce excessive downtime and maintenance costs incurred through the frequent replacement of worn pinch valve sleeves. The Ceramic Plug and Seat Valves, which can be automated with an actuator to suit customer applications, is used to control abrasive slurries with a maximum particle size of 3 mm. The Ceramic Plug and Seat Valve can achieve at least ten times the life of conventional control valves eliminating the need to inspect and replace valves which in turn reduces process downtime considerably. The ceramic valve gives an excellent cost to life ratio. 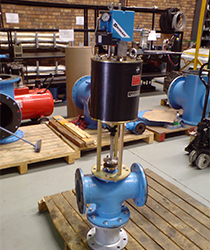 Most actuators can be fitted to the ceramic valve with only minor modifications to the mounting bracket. All Ceramic Valve Components Are Readily Available From PrepQuip, Feel Free To Contact Us With Any Enquiries.